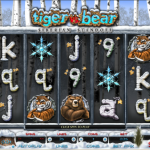 Tiger VS Bear is a Microgaming slot which takes you deep into the Siberian tundra. Here you will have a chance to see the wildlife, but not in the way you would expect. The two most powerful predators in the tundra, the tiger and the bear, have decided to test their strength in battle and decide once and for all who the king of the tundra is. It’s up to you to choose your favorite and hope he wins the match. If you win you can get hefty payouts, if you lose, well you can always try again. The slot has attractive visual effects and great symbol details, which make it attractive to the eye. Tiger VS Bear has a Wild symbol which will substitute for all other symbols except for the scatter symbol. Whenever the Wild substitutes in a winning combination he will also double the payout. The scatter symbol in the slot can land on all of the reels, but doesn’t trigger any bonus feature. He comes with a maximum payout of 50 x stake when 5 of them land on the reels. The slot also has a bonus round called the Siberian Battle. It is triggered when the Tiger lands on reel 1 and the Bear lands on reel 5, or vice versa. Here you will need to choose the Bear of the Tiger. They fight and only one will win. If you choose the Tiger and he wins you get 8 free spins, if he loses only 4 free spins. On each spin you can win up to three wild reels on reels 2, 3 and 4. If the Bear wins you are taken to another screen where you need to make picks and earn coin prizes. 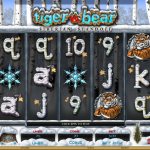 Tiger VS Bear is a very interesting Microgaming slot with an attractive bonus feature. 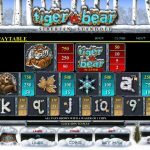 With up to three wild reels in the bonus round and big coin wins in the Bear feature, Tiger VS Bear is a slot worth playing. How does a Nordic slot sounds? Great! so you should definitely play Thunderstruck a 5 reel slot by MicroGaming.